Job. Career. Calling. Whatever you decide to call it, only you can define it. Christine Homolko, Rootless storyteller, transformational coach, and creative rebel. I have 8+ years of experience in communication and talent development. Why does it feel like there are people who diligently follow a calling, while some fall into a career and others struggle with defining a career at all? I’ve lived in four countries so far, each with its own ingrained definition of a career. In the past, everyone pretty much agreed on career representing vertical continuity in your professional life: find a job, get better at it, and move up. Nowadays, horizontal continuity is en vogue. That means people aren’t necessarily sticking to their expertise, but rather set on exploring and adding new skills to their careers. When I was younger, I wanted a career in the traditional sense. I saw myself wearing a suit, sitting in an office, going to meetings, traveling to conferences, and regularly climbing ladder steps. And by the way, I wasn’t alone in this preconception: 4,000 miles away from where I grew up, Sarah Elkins dreamt about a similar career, one that embodied a corporate lifestyle. While in college, that first visual was still playing in the back of my head, but this time I actually saw myself working in specific jobs. When I finally hopped toward the job market, eager to kick-start this career, it smacked me down. Hard. Like a bouncer who kept telling me: nope, you’re not getting in. Now, in my thirties, I feel like I am miles away from my initial definition of a career. After speaking to several people, reading a ton of articles, and quizzing some of you on LinkedIn, I came up with four different views on the word career. Some people say their career is their passion. Their mojo. Their precious. To me, these individuals embody clarity, perseverance, and skill. Talking to them is uplifting and inspiring: they radiate purposefulness. I love listening to their stories. If this is you, kudos. Probably not. Or maybe they do. If you recognize yourself here, what was your process? Oh, and if you’re still wondering whether your career truly is your passion or a just a passing fancy, Kathleen Byars’ got your back right here. I went to school for journalism and had a job editing the paper. Afterwards, I found myself in the startup world as a social media and content writer. It’s not what I originally envisioned, but it’s fun and it’s different every day. For others, the road is bumpy, there are potholes everywhere, and the road signs are illegible. You try to make it work, learn to read the signs and better navigate the potholes, and maybe you come to enjoy the ride. Or you don’t. Seriously, if you can’t see yourself continuing down a career road, you need to begin pivoting careers asap. 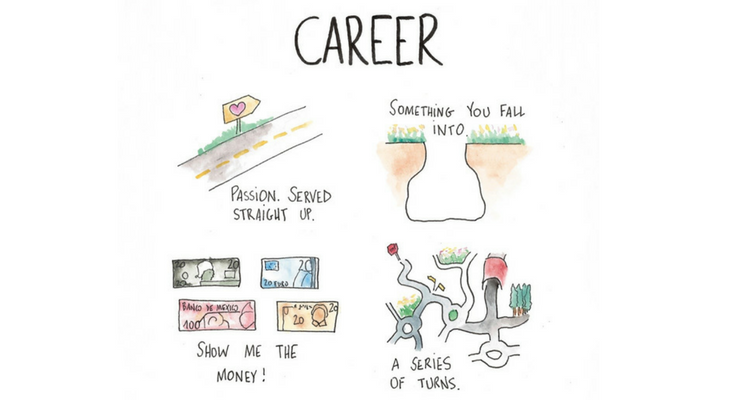 Finding a purposeful career is no easy feat. In fact, people spend a great deal of time in analysis paralysis. And I get it. When you’ve opened the wrong door before, you kind of want to make sure you’ll be in tune with the next one that opens up. This trial and error process is exhausting: it’s both psychologically demanding and financially burdening. Plus, if we’re being honest with ourselves here, society hasn’t yet fully embraced the concept of changing careers midway. The naked truth? Keep exploring. Yes, this clearly isn’t the most comfortable, safest career path to take. But this is your life, wouldn’t you want to put your happiness first? I was actually planning on going into medical school before but life plans changed and my wife and I decided we wanted to start having kids. My first son was born and I needed to provide for my family. After being in sales I realized a common thread in all of my young career plans and that was I liked working with and helping people. Last but not least, a career is a source of income. Perhaps you’re feeling ok in your current job. You’re not overworked, you get to come home on time, and the paycheck is sufficient. In your free time, your income allows you to follow your passion. Be it knitting, dog training, traveling, or spending quality time with your family. It really depends on if that person is looking for fulfillment on the job or not. Some do, so they are probably looking to get paid while helping make the world a better place & doing something they are passionate about. Others may have chosen to do that on their own time. “Is this my purpose?” Has been following me around for the past few years. It’s crept into the back of my mind, u-hauled all of its boxes here, and settled in. allow me to pay my bills. make sense to me: I can appreciate the outcome of my efforts (It doesn’t matter if you’re pouring drinks or crunching numbers here: you can see some purpose in what you do). give me a sense of contentment (or dare I say: make me happy). Note: happy doesn’t mean fun. You can have fun once in a while, but being content with your life is much, much more fulfilling (indulge in Gretchen Rubin’s Happiness Project for more Aha-moments on the concept of happiness). We’re all constantly changing. What makes you happy now might be completely different in 5 years. What does your career checklist look like? Originally published at https://www.linkedin.com on April 18, 2017.